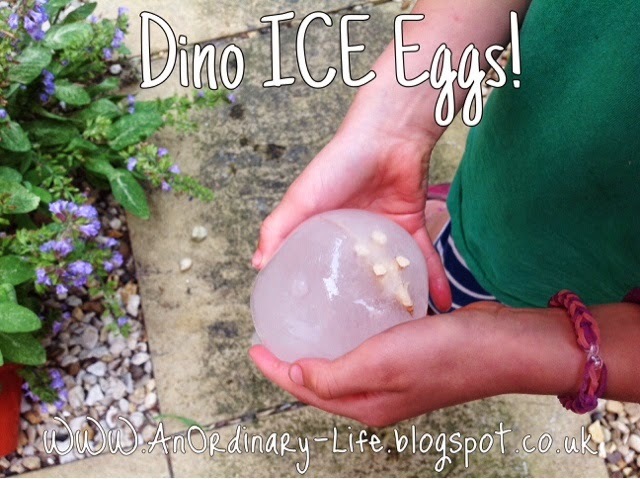 An Ordinary Life : Dino Ice Eggs! I have been thinking of ways to keep my girls cool, entertained and educated in the sun. I thought about doing Ice Marbles but then had a brain wave. You will need two people to do this bit as you will need one person to stretch the opening of the balloon as much as you can and the second person to pop the dinosaur in (it's best if it's the youngest of the helpers is the 'second person'). Carefully fill the balloon, with your dinosaur now in it, with water. Not completely full, about the size of a tennis ball. Freeze the balloon over night.